Why is my toolbar black? I turned on my computer today and I can't see anything on my toolbar, it is black. Everything I have tried hasn't worked. Any suggestions? Thanks. Interesting problem. More than likely something you installed or updated changed a setting. It may be an update you put in that didn't take affect until you rebooted your PC. Either way I found a place for you to look if you haven't already. I'm giving instructions through a Vista PC so if my instructions aren't exactly right you will need to look for something similar. Click on your START button in the bottom left of your screen. In Vista this window looks like what is pictured below. I think you will find your selection to be the black color. 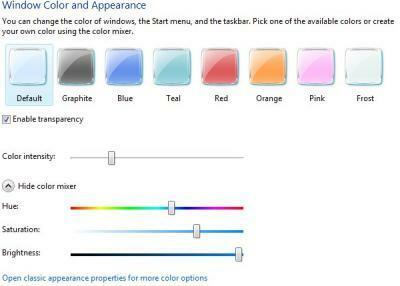 The picture I added here is the standard install settings when windows is first installed. Change it and see if it helps. There is also a link at the bottom of the page for CLASSIC WINDOWS setting. Sometimes in classic windows you can clear up problems that Vista windows is to dumb to understand. Just noticed, looking at the picture, there is a check box labeled "Enable Transparency". Make sure that has a check in it. That might be part of the problem as well. Thank you soo much!!! It worked!!! Ask your computer. I use Yahoo. It will give you an answer, good luck. Rightclick on your desktop, go to properties, under "theme" reset your theme to the one you like. This has happened to me in the past.